Finally I was able to get my 1st shot of Cervical Cancer Vaccine yesterday. 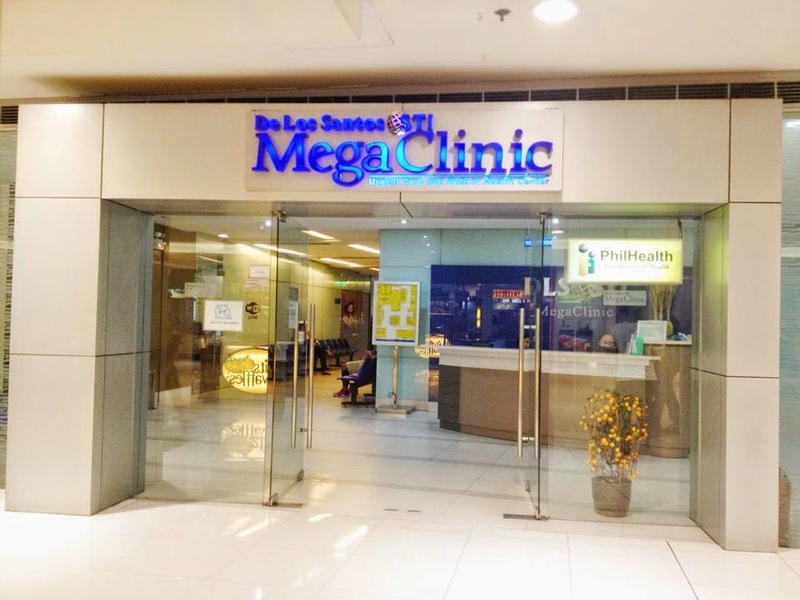 I was relieved when my co-worker referred me to go to MegaClinic in SM Megamall. 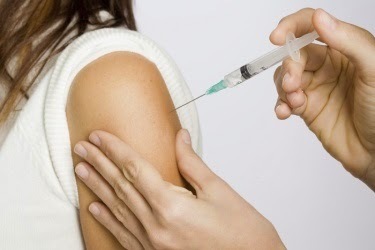 MegaClinic offers installment on Cervical Cancer Vaccine. They have this program called Pave Program wherein they are partnered with BPI Globe BanKO Inc. BPI BanKO provides loan for the person who will avail the vaccine for 9, 000 pesos. Cervical Cancer is the second most common cancer that is affecting women second to breast cancer. What if I miss my second or third dose? There is no need to restart the vaccine series due to missed doses. If you miss the second dose, you may get the shot as soon as you remember; you would then get your third dose after 12 weeks. If you miss the third dose, you may get the shot as soon as possible. It is important to get all three doses to ensure maximum effectiveness. Do we have to be screened prior to vaccination? There is no recommended screening method for HPV prior to vaccination at the moment. Should I still continue regular screening and testing even after I have been vaccinated? Yes. Cervical cancer screening should still continue for women, regardless of whether or not they have been vaccinated. For more information on cervical cancer, visit the Cervical Cancer Prevention Network (CECAP) website at www.cecaphil.org. 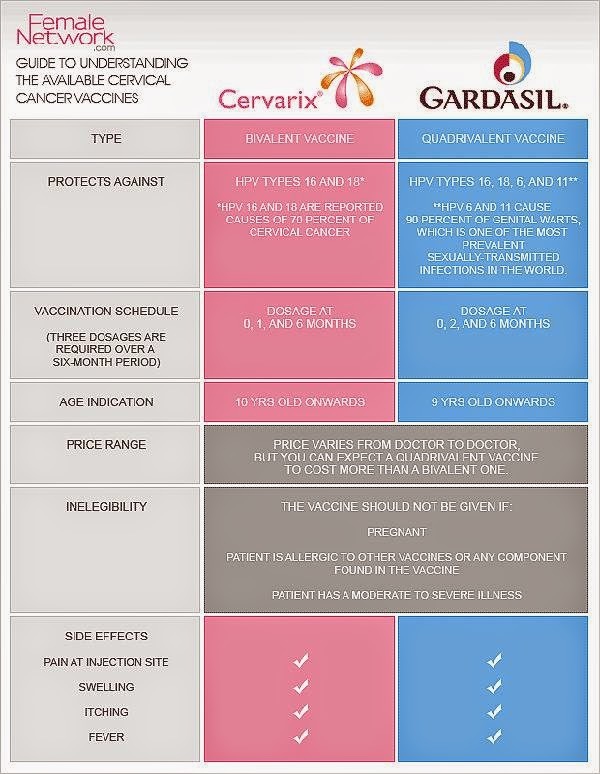 I always wanted to have a cervical cancer vaccine even before that I don't have my twins yet. But it's really expensive. One shot is 3, 500 pesos and there are 3 sessions. So that is a total of 10,500. To tell you honestly, I can't afford a one time big time payment of 3,500. Even before that I was single, I can't afford that price. Back then I was the breadwinner of our family. I was helping my brother and my father financially. We don't rely on my mother's remittance. I really don't want her to send us money every month because it was my time to help her. Fast forward, I still can't afford that much money. First, because I need to buy my kid's milk and pay the bills. Second, I am the only one working and our budget is just enough until the next payday. I am so paranoid with cancer now since my auntie and mom was diagnosed with ovarian cancer & breast cancer respectively. So better take it now or regret later. There, enough with my rant and let's go to the main topic of this post. It is a good news that Cervical Cancer can be prevented and treated if diagnosed early. See my post about it here. When I got a time off from work, I immediately scheduled a consultation in MegaClinic, SM Megamall. Upon entering, you need to register on the information center and go straight to the nurse section. Now, don't forget to tell the nurse that you are availing the program for the installment of the Cervical Vaccine shot. I handed my health card to the nurse and was lined up for Dr Rama. It was a misunderstanding at first because I should go to the person who is handling the program before going to the doctor. I was asking the nurse after the consultation on why I had to pay 1,000 pesos? I should have registered first for the program before anything else. Ok my bad. I also asked the doctor if I should have a pap-smear first? I read on a certain article that it doesn't necessarily needed to have a screen test but I wanted to have a pap-smear too just to be sure that everything is ok. It is covered on my card so there is no problem with that. She did the pap-smear first then gave me the first shot and the next shot will be after 2 months. The result of the pap-smear will be given after 6 days. 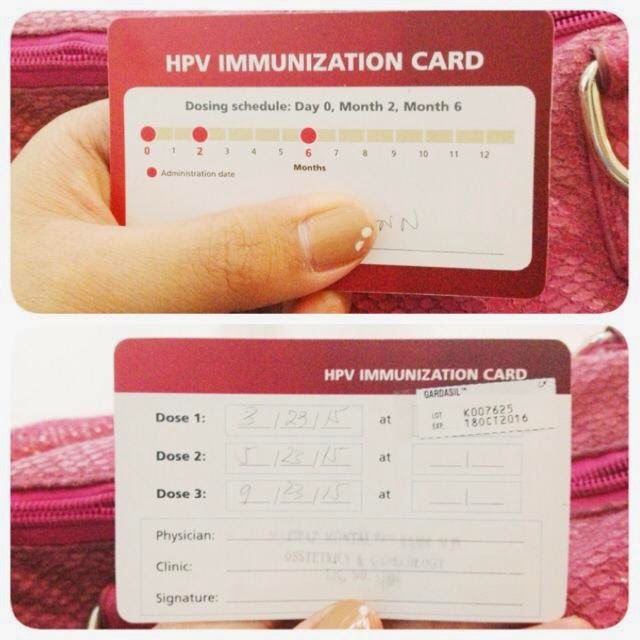 Then, they gave me my HPV Immunization Card with the dosing schedule. Afterwards, I went to Kuya Francis. He is the one in charge for the Pave Program. He is seated at the far right corner from the nurse section. After getting the prescription from Dr Rama, he then handed me the Participant Informed Consent Form to read. Then I filled out a form for my information. Together with this are the paper for the Term Loan Agreement with Promissory Note & the Pave Program - Information To Remember sheet. He also asked for 2 valid ID's. We then waited for my account no that is needed for paying the loan. He explained to me that I will be paying an amount of 500 pesos every 1st and 16th of the month. The first payment will be on April 16th. The 1,000 pesos that I paid earlier was the cash out. Every time that I will get vaccinated, I will pay 1,000 pesos. The total payment is 12, 000 pesos and I will be finished on January 01, 2016. Lastly, he gave me the voucher amounting to 3,000 pesos. This is the proof that I availed this program. He advised me to go directly to him before going to the doctor for my second shot to ensure that the payments are according to the amortization schedule. Paying the loan is at BanKO's partner outlets with the Loan Account or Reference # and Loan Code #. It was a bit expensive. My co-worker who referred me to this program said that her doctor is charging her 3,700 per shot. The nurse said it depends on the doctor who will give the shot. Plus she is not my OB. So I am paying 900 pesos more. But it really doesn't matter as long as I have the options to pay it by installment. Considering that I'll benefit from it, its a win-win situation. This is also a great investment for my health especially that there are 2 kids who rely on me. If you have questions about this program, you can go directly to the nurse section in MegaClinic, Megamall.